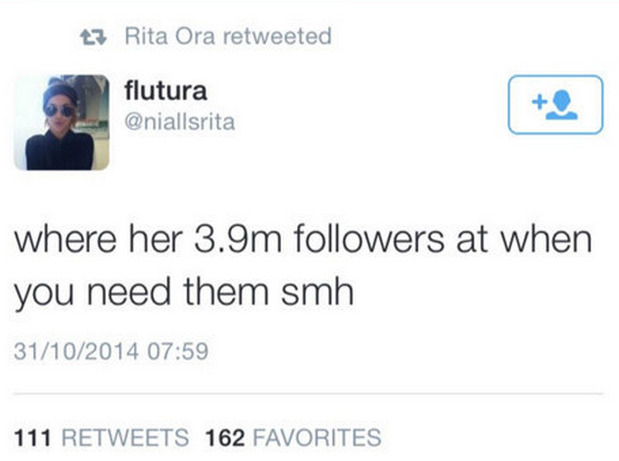 Pop singer Rita Ora has 3.95 million Twitter followers, but it appears the force of her fans may not be that strong. After getting just 2,000 retweets, Ora allegedly deleted her initial post entirely. 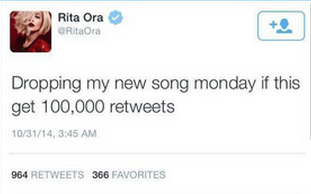 @RitaOra lol we all know you are just mad you didn’t get 100,000 RT’s Cmon girl!!! Can I get to 7000 Twitter followers by tonight? I promise I won’t delete these tweet out of embarrassment if I don’t, unlike Rita Ora. Lol! Despite being prominently featured on Iggy Azalea’s current hit song “Black Widow,” Ora — who has been signed to Jay Z’s Roc Nation record label since 2009 — is still trying to build a personal fan base. It appears Ora, like many celebrities, bought a hefty amount of her nearly 4 million Twitter followers. According to TwitterAudit.com, the singer purchased 1,366,326 of her followers, which may explain the lackluster response to new music.